Pvilion Earns Three International Achievement Awards! The Industrial Fabrics Association International recognized three of our projects for exceptional design in the 2015 expo. The Photovoltaic Tensile Parking Structure earned an award of Excellence in the Free-Standing Structures category. This project marks the first application of a tensile membrane structure with integrated flexible monocrystalline photovoltaic modules, an integration of tensile and solar technology wiring into one fabric membrane! The technologies are the subject of an international patent application. The Carnegie Hall Gala Tent earned an award of Outstanding Achievement in the Air Structures category! 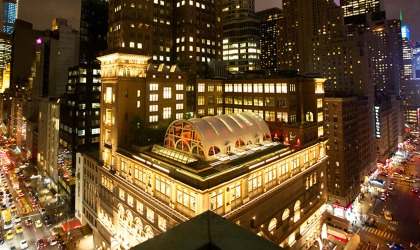 Engineered for NYC Building Code for temporary structures, this tent can accommodate 500 attendees for events atop one of New York's most landmarked buildings. The tensile-structure fabric top is supported by high-pressure air beams, and anchored by permanent steel plates connected to the underlying framework of the building. Its lightweight, flexible construction allowed for materials to be transported through the freight elevator, which avoided the cost and hassle of street closings. The Tommy Hilfiger Solar Jacket was honored in the Technical ad Other category. Pvilion partnered with Tommy Hilfiger to design a solar-powered jacket exclusively for he holiday 2014 season. The jacket harnesses, converts, and stores solar energy. Pvilion's detachable solar panels lay on the back of the jacket, while a discreet cable runs through the lining of the jacket to a battery pack in the front pocket, where a user can connect up to two devices via USB cord. The jacket celebrates the fusion of beautiful design and innovative technology, serving the wants and needs of the modern adventurer. IFAI received a total of 293 entries from 11 countries that were submitted in 31 categories in this year's competition. Winners were selected based on complexity, design, workmanship, uniqueness and function. Judges included industry experts, editors, architects, educators, and degisn professionals who were chosen for their knowledge in a particular field of study or product area.